Usually if a cake was required for a birthday or any other type of celebration for that matter I would pop down to Tesco and buy one of the small range of cakes they have in store. That whole idea changed when I came across a fantastic blog by a professional cake designer called Trudy. The Bake Me A Cake Blog features many examples of her work and the picture to the right is one of my favourites. Trudy is based in Surrey in the South East of the UK and will design cakes for any type of celebratory event whether its birthday parties, weddings or Christmas. What's more she can even deliver the cake right to your door (locally) for a small extra charge ensuring it arrives in perfect condition and fresh as ever. 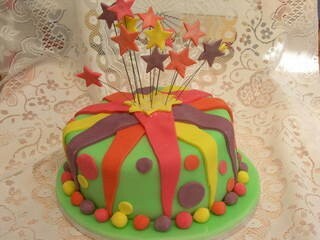 Please take a moment to visit the Bake Me A Cake website and have a look at some of her beautiful work.